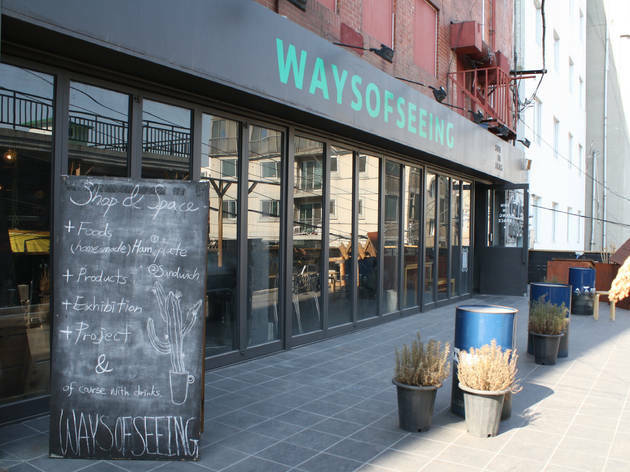 Ways of Seeing is a cultural multispace run by the artist collective Sun In Jang (a play on words that literally means “cactus” and also implies the gathering of admirable people). While they also run a café and shop, it’s so much more—rotating art exhibits fill the space; workshops, film screenings and concerts take place here; and fashion magazine Cracker Your Wardrobe has been hosting the FIFTY SEOUL charity flea market here since 2011. If you’re simply looking for a place to get a drink and something to eat, the menu offers plenty of options. Vegans and the lactose intolerant will be happy to see soy milk coffee drinks, which can be difficult to find at independent cafes in Seoul. Meat eaters will appreciate the handmade ham sandwich. 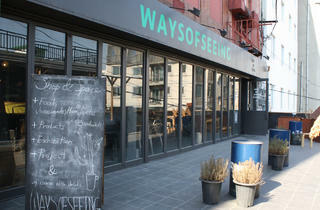 Fans of sunlight (and smoking) take note: There’s a giant deck with outdoor seating in nice weather.